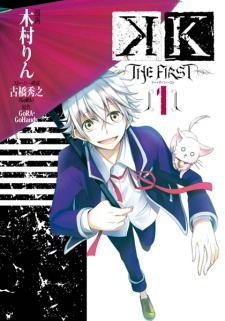 K: The First is based on GoHands' original TV anime series K.
Story 8: So first, K: The First is a prequel to the original anime K, and as such relies pretty heavily on the reader having already seen the show. With that said, you can watch this first as it does go out of its way to give solid character introductions that can be used to at least fill in the basics from the show, but it will hinder your enjoyment if you go this route. Now, the plot and direction is pretty solid, with a definitive end point to head towards the series takes its time filling in on the life of Shiro and the conflicts that lead up to the anime without feeling like its rushing or dragging its feet. The series, while not adding much to world itself adds a great deal of character development and growth that makes it worth reading. Art 5: The art is surprisingly unappealing to me, whilst not bad in any degree, it just feels really off. Certain characters look too flat when put alongside others who in turn feel like they were done by a separate artist and then later edited in digitally. Its just really jarring and inconsistent, at times going for a very standard manga form, and at others featuring an art that is very similar to its anime counter part, which while very pretty, doesn't work in this manga, and just looks bizarre. The reason its not lower however, is the strong environment design and the way they have the energy waves flourish around the characters. Character 7: The characterization is strong in this series, as it focuses on developing them into the point that they appear in the show, but this series does not do it quite as strong as the anime itself, again relying on the reader's prior knowledge to help pace the narrative. enjoyment 8: just to be clear, I am a big fan of the K franchise, and in turn I enjoyed this manga. It has a fair bit of comedy, solid characterization, and fills some of the blanks that the anime could not while giving a decent set of b plots that adds to the characterization of a lot of the cast. Over all 7: In the end K: The First is exactly what it looks like, a K story, with a structure similar to K, with a weird art style like K, and a unique and intriguing world....like K. So, if you are a fan of the K project franchise, you're going to enjoy it, but if you aren't then this wont be your cup of tea, its that simple.